London Week would not be complete without a peek at the Royal gems of course. Jewelry plays a central role in the fascination with the family. Here are a few of their most intriguing pieces just in time to celebrate season two of The Crown on Netflix. watch it immediately if you haven't already! First created by official Court jeweler Garrard for Queen Mary in 1914, the tiara was then handed down to Queen Elizabeth II who loaned it to Princess Diana in 1981. After the Lover's Knot tiara was returned, it wasn't seen publicly again until the Duchess of Cambridge wore it in 2015. 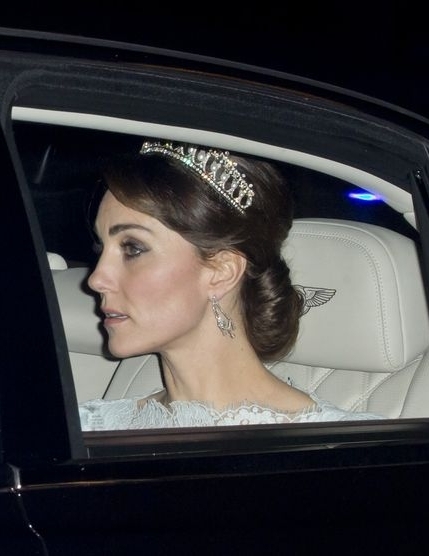 Tiaras are the symbol that we most associate with princesses and Kate does not disappoint. On her wedding day in 2011, she famously wore this Cartier "Halo" tiara, featuring 739 brilliants and 149 baton diamonds decorating the tiara's 16 scrolls. The tiara was originally purchased from Cartier in 1936 by King George VI as an anniversary present for his wife, Queen Elizabeth the Queen Mother who then gave it to Queen Elizabeth II on her 18th birthday. Always the fashion forerunner, and closely associated with sapphires, Diana took a sapphire watch that was part of a set given to her by the Saudi Royal family as a wedding gift and made it into a headband. Another one of Diana's famous sapphires continues to preserve her memory after Prince William gave it to Kate to propose while on safari in Kenya. The ring was originally Diana's engagement ring from Prince Charles who was inspired by a sapphire and diamond brooch that his mother wore often. The brooch was originally given to Queen Victoria by Prince Albert. Of course some of the most striking gems in the Royal collection are the coronation regalia as part of the crown jewels. In this photo at her coronation in June 1953, Queen Elizabeth II wears the Imperial State Crown, which is set with 2,868 diamonds, 17 sapphires, 11 emeralds, 269 pearls and 4 rubies. And one can't mention the Royal jewels without acknowledging the extensive collection of Wallis Simpson and the former King Edward. They were famous for giving each other extravagant pieces, often engraved with coded messages, to show their love. 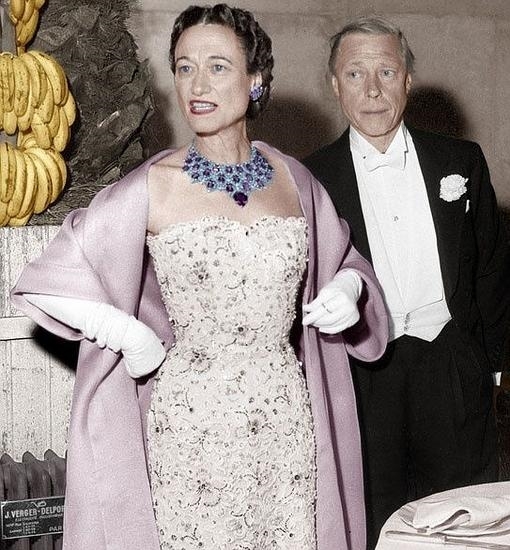 This bib necklace with matching ear clips was made by Cartier in 1947 using 158 cts of step cut amethysts supplied by the Duke. The necklace is set off by turquoises and diamonds in a twisted gold lattice. 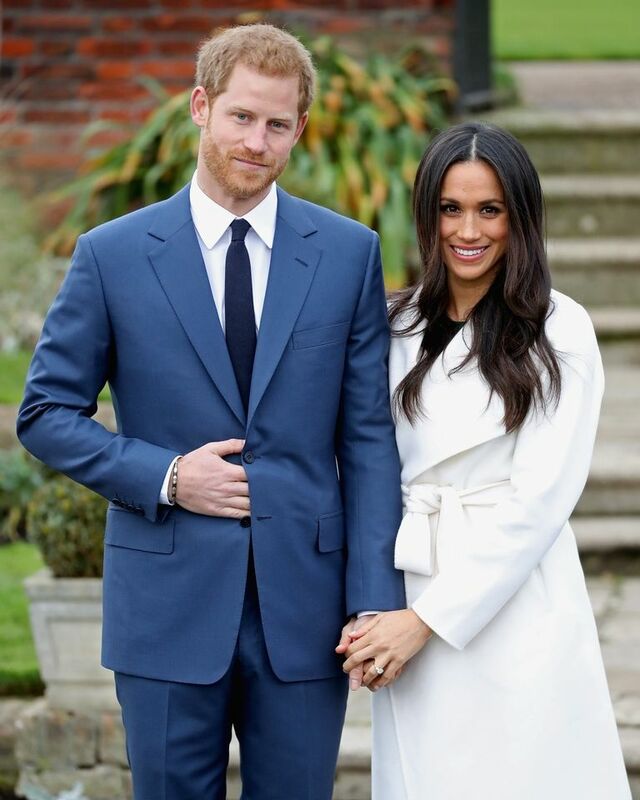 And of course the newest gem in the Royal collection is the engagement ring given to Megan Markle by Prince Harry. Harry designed the ring himself and had it made by court jewelers Cleave and Company. 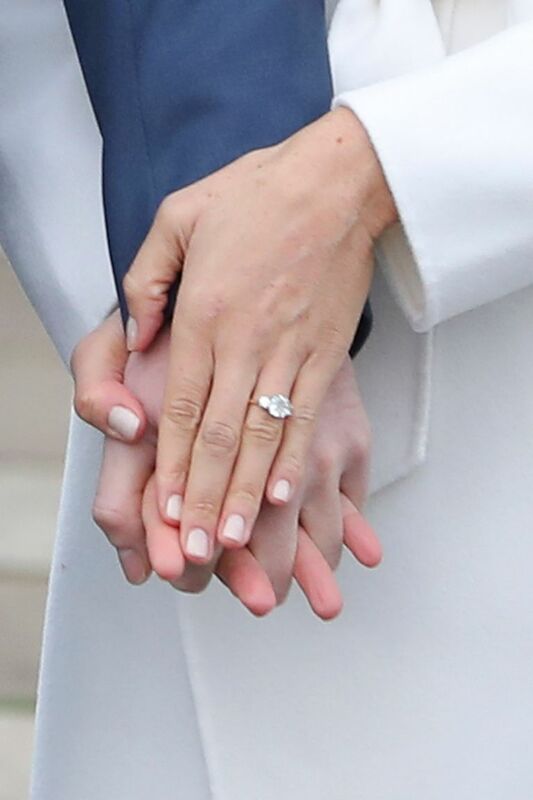 It features a round brilliant diamond from Botswana and two smaller round diamonds from Diana's collection, set in Megan's favorite, yellow gold.